by Janice Christensen image courtesy of Hammel, Green and Abrahamson, Inc.
On Jan. 20 the Milwaukee Redevelopment Authority approved a plan to sell $68 million in bonds to finance redevelopment of the Kenilworth Building at 1925 E. Kenilworth Pl. (New Lease on Life for Kenilworth Building, RWC, December, 2004). The Authority approved a long-term lease agreement whereby they will lease the building from UW Milwaukee, then lease it back to the state after the redevelopment is completed. 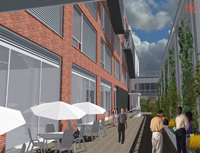 Improvements will transform the building into a public-private facility that offers a public arts center, retail, UWM art class space, student housing and private condominiums. The building is currently used by UWM for storage and support services. Rental income from the state will pay off the bonds. The structure will be divided into two buildings, one facing Farwell Avenue and one facing Prospect Avenue. According to Jim Plaisted, executive director of the East Side Business Improvement District, the Prospect Avenue building will feature a street-front gallery showcase for the UWM Peck School of the Arts. “There will be extensive street-scaping along the Prospect Avenue face of the building, with trees and plantings” to improve the building’s attractiveness. The second floor of the building will be used as a parking garage. The Farwell Avenue building will contain apartments and student housing. Street-level retail spaces in the two buildings will be offered to shops and restaurants. Weas Development Co, in partnership with the Milwaukee Development Corp., plans to complete the conversion to be available for use during the 2006-2007 academic year. “Watch for construction to begin soon,” Plaisted said. In addition to the converted buildings, the developers will privately finance an additional building in a vacant lot to the south, on Prospect Avenue, that will contain 25 to 30 condominiums. The plan will be presented to the Milwaukee Common Council for final approval on Feb. 1.